Today we have a completely new Kombat Kast and Mortal Kombat 11 developers showed nothing but the ruling Emperor of Outworld, Kotal Kahn. 6bit" Brownback presented the character as he highlighted and discussed a number of different techniques while articulating Kahn's general style and approach. 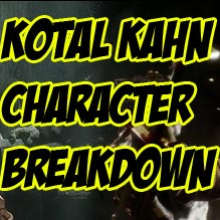 Kahn, who is quite similar to his plan in MKX, is both a Grappler and a Brawler and feels like a Boschar character with his exceptionally strong normals and huge stature. Continue for more. Kotal Kahn seems to be the best in the middle, as his long limbs give him a remarkable range. Although not too fast, he is certainly very heavy and seems to need fewer openings than most in the MK11 roster. On paper, this character is very scary, as he has a large selection of tools that help him mostly on the offensive. He also has a counter-technique for opponents who are overzealous, but he seems to be in best shape from medium range and close up. One thing is clear, this is one of the most brutal fighters we have. I've seen how many of his attacks make us feel even worse than normal (which really means something with MK11).